I have taught a night course entitled In the Footsteps of the Impressionists each year since 2004 at The University of Western Ontario, and since 2009 at the University of Toronto. Since my academic training is in economics, I feel I owe the reader some explanation. 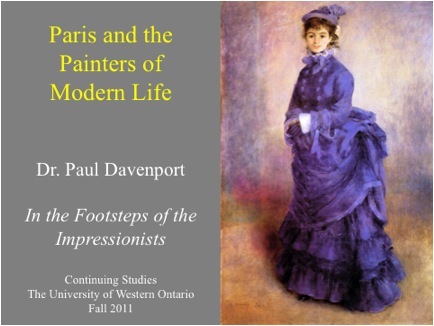 Introductory slide for my course "In the Footsteps of the Impressionists"
In 1967 I spent six months in Tours, France, as part of the Overseas Campus Program of Stanford University. From March to August, sixty of us lived in a building on the Loire River and took the train into Paris on the weekends. My first visit to Paris took me to the Louvre, where a few friends and I got lost and frustrated, unable to find most things we were looking for. Years later I read Zola’s Assomoir (my favorite Zola novel) which has an amusing but all too true to life account of a wedding party which goes to the Louvre for amusement after the ceremony. The group gets lost in the endless galleries, becomes wearied and footsore, and is almost locked in when the museum closes. I have grown to love the Louvre, and I no longer get lost there, but for first time visitors it can be exhausting. Leaving the Louvre, we walked down the Tuileries Gardens to the northwest corner, and entered a another art museum, the Jeu de Paume, with an odd shape, 80 m long but only 13 m wide (87 by 14 yards). Inside was magic. From 1947 to 1986, when the Orsay Museum was opened, the Jeu de Paume housed the Impressionist collection owned by the French state. I lost myself in the beauty of the works, and imagined myself walking along one of Monet’s many river scenes, or watching Degas’ ballerinas spin through the air in an opera house. 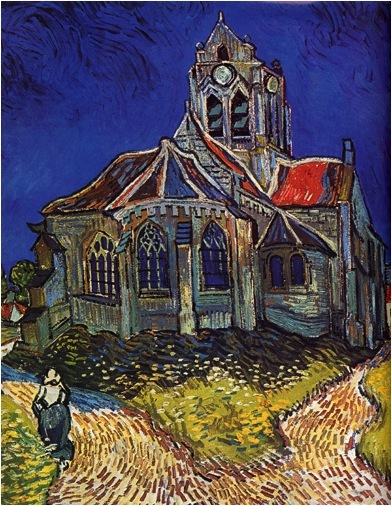 I loved Van Gogh’s The Church at Auvers and bought a poster that hung in my rooms for many years. Vincent Van Gogh, "The Church at Auvers," 1890. I came back again and again during those six months in 1967 and developed a love for Impressionist paintings which continues to this day. I bought books on the subject and after 1986 when my wife and I visited Paris during our annual vacations in France, the Orsay was a favorite destination. In the spring of 1998, as President of The University of Western Ontario, I was asked to lead a barge trip on the Seine River for a group of our alumni. I eagerly accepted and offered to give some lectures on the Impressionist painting done in Paris and the towns along the Seine on our itinerary. My lectures were a big hit with the alumni, and I began to think of teaching a non-credit course on the subject when time became available. 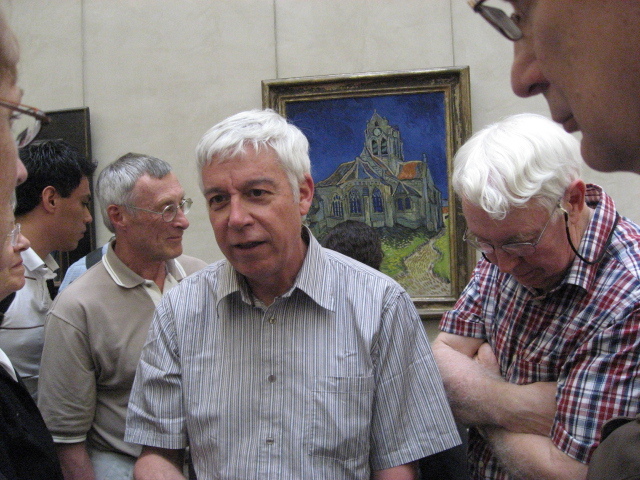 The picture below shows me in 2008 with an alumni group at the Orsay Museum, discussing The Church at Auvers, which hangs on the wall behind me. By chance during the 1998 barge trip I came upon a model for my proposed course. Our first morning in Paris I walked the group over from our hotel on the rue du Bac to the Musée d’Orsay and took them through the stunning Impressionist art there. As we were leaving, Josette spotted the entrance to a special exhibit on the north side of the building devoted to Monet and Manet. It turned out the exhibit was in its final days: Manet, Monet: La gare Saint-Lazare was scheduled for February 9 to May 17 at the Orsay, and then would move to the National Gallery of Art in Washington from June 14 to September 20. The exhibit showed maps and documents which allowed one to situate the paintings of the railway station and its neighborhood in time and space. I bought the catalogue of the exhibit and found I could not put it down that night. Near the start of the book, an overhead photograph of the Europe Quarter, with streets, buildings, and the location of the paintings all clearly indicated, invites the reader to walk through the Paris of today, with her eyes on paintings and literary works of the 1870s. A foreword to the book underlines its multidisciplinary approach, linking the art to economic and social history and urban geography. By daybreak I had worked out the concept of a course (and I hope one day a book) for non-specialists, which would walk students in the footsteps of the Impressionists, on the Paris streets and in the suburban towns where the painters set up their easels. My blogs on the Impressionists will seek to reproduce the enjoyment of those walks and to shed light on the historical and social context of these beautiful paintings. The Impressionist sites have become part of my intellectual neighborhood and I take great pleasure in showing them to others. Beginning in 2010, Western Continuing Studies has offered a ten-day trip to Paris and its suburbs, where we experience the magic of Paris together andI lead the group to Impressionist sites. 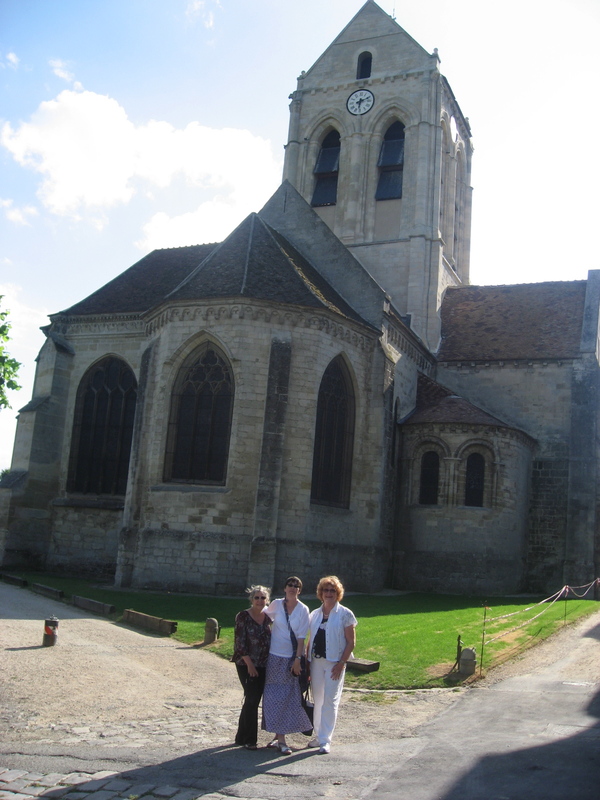 Here are three women who took part in our 2010 trip, during our visit to the church at Auvers.